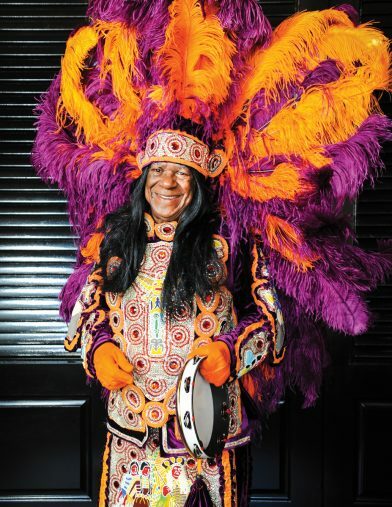 Monk Boudreaux was born to be a Mardi Gras Indian. It is not a career, a craft or a profession, though one needs to go through an apprenticeship to become one. It’s a blood and spirit celebration of the bond between African people brought to the New World as slaves and the indigenous people who were here when they arrived. The interchange was not just cultural. Monk, like many Mardi Gras Indians, is part of the undocumented creolization that occurred when the arrivals to the New World interacted with its indigenous people. Emancipated blacks, like many other Americans, were reluctant to admit a native heritage at a time when the United States was in open warfare with the Indian nations. You don’t want to go from the plantation to the reservation. “Choctaw Indian, we Indians,” Monk explains. “Mardi Gras day we don’t just be doing this for masking. We be doing this for who we really are. It was a hidden thing. The older people hid this because they was hiding from the government because they didn’t want to be put on the reservation. That’s why they kept it low ’file and they never to talked to nobody ’bout it. Mardi Gras day was the day. Monk is a leader, a folklorist, a singer of songs, a storyteller, and a window into a unique corner of humanity. His trademark phrase, delivered with a tolerance that defines the infinite patience of a master of oral tradition, is “They don’t understand.” His mission is to make them understand. Accordingly, he learned the oldest traditional Mardi Gras Indian songs and added his own to the mix. 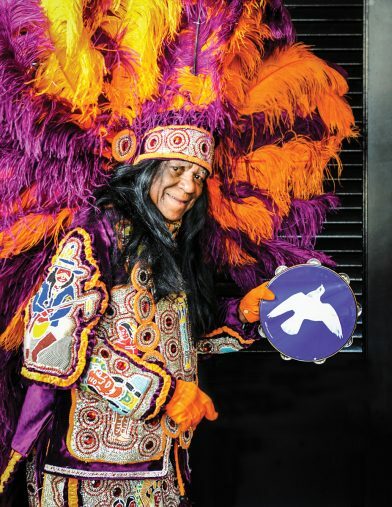 He has been a mentor to countless Mardi Gras Indians himself, and has been generous in opening the secrets of that tradition to outsiders, not just in New Orleans but all over the world. He is the greatest of teachers in that he will share his message with anyone who will listen. We were fortunate to get a lesson from him on the eve of his 76th birthday. Joseph Pierre “Monk” Boudreaux was born on what the history books call the “Day of Infamy,” December 7, 1941, the day Japan attacked Pearl Harbor and pulled the U.S. into World War II. The day has no such significance for him, as his education took place outside the realm of a school system that had no use for him. “My family will be there on my birthday, but I’m not planning a party, because I’ve got to sew, got to get the suits ready for Mardi Gras day,” he says. Monk helps prepare the suits for his whole family. He says he expects “15 to 17” of his relatives to join him on his procession this year. We arrived in front of Monk’s Uptown house to pick him up. The house took on six feet of water in the Katrina flood and Monk used the carpentry skills handed down from his father and grandfather to rebuild it. “I put up all the sheet rock, did all the painting,” he says proudly. “They tell me the house is worth $250,000, but it’s worth more than that to me.” Monk’s story was used as part of the storyline of David Simon’s HBO series Treme. He was the inspiration for the character Albert Lambreaux. Simon also used Monk as himself for the drama in a powerful moment during the first episode. Monk’s return after the flood to find his Mardi Gras Indian suit in the safe place he stashed it before leaving town is documented in the 2010 film Bury the Hatchet. We took off to trace a route down to where Monk grew up, a block away from his Mardi Gras day destination, the Sportsman’s Bar at the corner of Second and Dryades. “We don’t have a set route,” he says. “We go whichever way seems best at the time. I signal the spy boy ahead which route to take.” Our route today takes us along until we get to Dryades Street, where we retrace Monk’s steps on Mardi Gras day along with the steps of his life. Monk’s father masked with the Wild Squatoolas. When Monk was a boy he was not allowed to be part of the rituals, especially on Mardi Gras day, when the children were under strict orders to stay on the porch and watch the Indians from there. Monk’s father left the gang before the boy started masking himself. He never told his son why he quit masking, but after Monk became chief his father started up again as second chief. “I was taught the Indian songs as a kid,” says Monk. “That’s where they come from. My dad was an Indian before I was, he masked Indian. He used to leave out at five o’clock in the morning so we had to stay in until he got back, catch him later on in the daytime. I think I was 12 when I was allowed to participate. Now all my grandkids when they’s one years old we take ’em out. But during that time you had to do your own suit so I had to wait ’til I learned how to sew my own Indian suit. The practices was held in the back yards, in the chief’s backyard. It was like a hidden culture y’know. Later we started having the practices in local bars. “I never intended to be a chief but when it was handed down I accepted it. That was before my father passed because he masked second chief for me. It was handed down. I was the second spy boy for the White Eagles. The way it go, the first spy boy he’s in line to be the chief, so when he didn’t want it it got handed down to me, second spy boy. So I accepted. “The spy boy, he’s part of the game because he’s number one. The chief is last but the spy boy is first. People don’t know that. They don’t know. I know they don’t know. I get a lot of questions everywhere I go, people ask questions. Monk arrived at Second and Dryades and was surrounded by a group of men eager to greet him. Inside, the affable barman Steve kindly turned down the TV so we could talk and took some snapshots of himself with Monk. This very block was where Monk grew up. Monk’s childhood haunts ranged all over the neighborhood. Though he was strictly forbidden from following the Indians downtown on Mardi Gras day, he had free rein the rest of the time. He got his nickname from climbing trees, making him witness to a lot of events, some of which he wasn’t supposed to see. But that curiosity led to a wisdom that has informed his storytelling to this day. Monk grew up with another local kid who would become a famous Mardi Gras Indian Chief, Bo Dollis. He was also tight with the Neville Brothers, especially Aaron, though he and Cyril played conga drums together at Indian practices. “We come up together, Jolly they uncle, big chief of the Wild Tchoupitoulas, we was all together. We used to have Indian practice, we’d go to his, he’d come to ours. Jolly got his name because he was a jolly fella, laughing all the time. He was a good person. He masked with the Wild Magnolias one time. “Nevilles was a presence. I was close to Cyril. Art is older than me about three years. Charles is the oldest. Aaron, I really knew Aaron, we were friends, still is. He was born with that voice. Bo knew him. New Orleans ain’t a big city, you got Uptown you got Downtown; you got back o’ town you got front o’ town; that’s it. Cyril started coming to practices but he wasn’t singing then, he was beatin’ the drum. “I knew Bo practically all my life. Because we come up in the same neighborhood, he was just a couple of blocks from me. I come up on First and Dryades and Bo came up around Jackson. I met him through a friend. I always did know Bo’s brother ’cause we around the same age, and then one day a friend brought Bo around our neighborhood and that’s how I met him. By this time Monk had built an encyclopedic knowledge of traditional Mardi Gras Indian songs and was embellishing them with his own stories. Monk and Bo were at the forefront of the young Mardi Gras Indians in the late 1960s, introducing new ideas into the old traditions. By this time the White Eagles had broken up and Monk was leading the Golden Eagles. Bo was Chief of the Wild Magnolias. 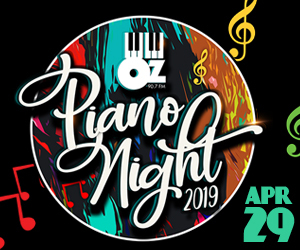 In 1970 Davis brought them into the studio with keyboardist Willie Tee, bassist George French and drummer Joseph “Zigaboo” Modeliste backing up the Indians to make a 45 rpm recording of “Handa Wanda” and the rest is history. “We didn’t have any idea about recording,” says Monk. “We didn’t do anything different. They followed us; we didn’t follow them. Like I said we all come up together in New Orleans and Willie Tee had a band. Quint thought it would be a good idea to get Willie Tee with us because he come up in the neighborhood. He knew about the Indians. At the time he was doing a different type of music but we know that he could back us. Ain’t too many people even today that can back the Indians. It’s gotta come from your heart. It’s a new music to them where nobody else teaches this type of music. It’s the music they wanna play because it’s got a lot of fire to it, it’s a religion thing. They say gumbo, well that’s what Indian music is about, gumbo, it’s got all kinds of music, jazz, blues everything goes into it. “Willie Tee was from the neighborhood. One time he say he live on Third and I think Dryades, and he also lived on LaSalle Street, that’s when I was knowing him because we went to school together. He was big but to us it didn’t matter because we had our own music. We wasn’t into that recording thing, so as far as we knew he was joining us. “Handa Wanda” was in jukeboxes all across the city and remains a cornerstone piece of local music every Mardi Gras. 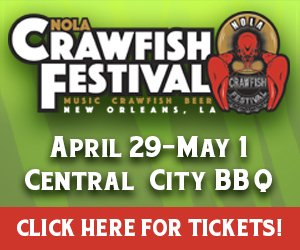 But the real moment Monk and Bo brought their music to the outside world came at the first New Orleans Jazz and Heritage Festival, when festival organizer Quint Davis asked them to lead a Mardi Gras Indian parade to the festival. The Indians became a regular feature of the festival. Davis got the band a contract with the French Polydor label and they made a record, then toured to promote it. Monk was glad to return to the neighborhood and his regular Indian practices because he wasn’t sold on the electric band concept. “During that time I was only doing percussion because that was the way I was taught and I didn’t like the idea of an electric band. I came out with my own record, made at a practice at the H&R Bar, which was Lightning and Thunder and that’s the way I felt it. Bo and I was together. He wasn’t on Lightning and Thunder because this was like a percussion thing but he was there. We hung out together all the time, every day. I went on with my percussion thing, played a lot of folk festivals, even when I didn’t have a record out. I went all over the world even without a record because people were seeing what I did as folk music. Bo and Monk made several records as the Wild Magnolias and toured under that name even as they kept their traditional gangs. They were powerful live as Bo, a natural R&B singer and entertainer, relished the role of the frontman as the more spirit-oriented Monk was edged into a role as backing vocalist. The stranger Monk was referring to was a manager who represented the Wild Magnolias, trademarked the name and concentrated on promoting Bo Dollis. Monk knew it was time to move off on his own. He made a series of records beginning with a terrific collaboration on Shanachie Records with Anders Osborne, producing one of his most powerful albums, Mr. Stranger Man. Monk by this point had warmed to the idea of blending his percussion band with electric guitars. Monk was a founding member of the Voice of the Wetlands All-Stars, a group dedicated to raising public awareness of the disappearing Gulf Coast. Then came Katrina, and everyone in New Orleans was forced to evacuate the devastated city. The black communities were pretty much wiped out and there was a sense that they might never return. The Mardi Gras Indian culture seemed in particular jeopardy. But Monk never wavered in his belief that it would return, and since 2005 he has been one of the most important leaders of that culture. Under Monk’s curatorial watch the Mardi Gras Indian presence at Jazz Fest has flourished. Not only has the culture revived, it has been refreshed with a lot of new blood and some of the gangs are introducing bold new elements into the traditional mix. “It’s gonna continue,” Monk promises. “It’ll never die. They gotta lotta young people comin’ out, they learnin’. They need somebody to teach them. You gotta sit down and listen. It was like we was doing a video shoot from the Treme and one of the producers come out and ask me ‘Monk, what are you sayin?’ Ha ha ha. I said that’s Indian talk you might not understand it but I was saying ‘Hold him Joe your donkey want water.’ I’m telling my spy boy to hold his donkey if he wants some water. He didn’t want no coconut water, that’s all they had. The way I do it they can’t understand when I talk that Indian talk ’cause it’s a secret language. On the way back to his house, on Freret Street approaching Louisiana, Monk recalled a rough moment on a recent Mardi Gras day. Monk can defuse that kind of madness with his power. And now he’s concentrating that power, every day, into sewing those Mardi Gras suits.